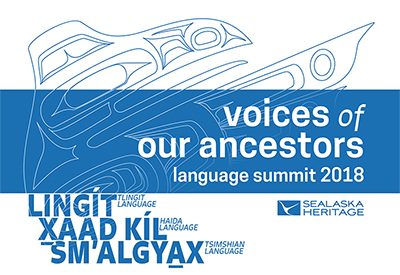 Sealaska Heritage Institute (SHI) next week will kick off its first Native language summit for speakers of Lingít (Tlingit), Xaad Kíl (Haida) and Sm’algyax (Tsimshian). The three-day event, Voices of Our Ancestors, is thought to be the first time an organization has sought to convene its remaining fluent, Native-language speakers. The summit is intended to be a celebration of language speakers, who were able to hold on to that birthright in the face of intense opposition and who have contributed to our language revitalization efforts, said SHI President Rosita Worl. “We want to recognize our fluent speakers for carrying our languages all of these years despite the pressures they faced from people who tried to eradicate our cultures. We are celebrating the survival of our language speakers and honoring them through this event,” Worl said. The summit is scheduled Nov. 13-15 at Centennial Hall in Juneau. SHI will videotape the event for its archives and stream it live online. A link to the live web stream will be posted at www.sealaskaheritage.org just prior to the summit. Plans also call for transcribing, translating and publishing the proceedings. SHI invited known fluent speakers living in Southeast Alaska and among the Interior Tlingit who share clan membership with the coastal Tlingit. The remaining speakers are elderly and in some cases infirm. Of the estimated 133 total speakers of the three languages in the region and the Interior, nearly 70 are expected to attend. The summit will also include fluent comprehenders or dormant speakers, people who grew up hearing and understanding the languages but do not speak their language; advanced language learners; and language specialists, people who are teaching the languages today and language students. A Canadian contingency are also bringing 30 of their language learners. SHI will have final numbers on participants next week. Language specialists are another group of unsung heroes in our quest to revitalize our languages, and we also want to sing their praises, Worl said. “Our language specialists took on the work of learning and teaching our languages, and we want to celebrate the success that we have seen through them. It wasn’t until we placed our language specialists into schools that we began to see real progress in language revitalization,” she said. The fluent speakers will be encouraged to speak in their Native tongue during the event. SHI will have interpreters on hand and headsets to allow participants to hear the English translations in real time. Moderators will lead discussions on questions such as “Memories of speaking my Native language in my home but things changed”; “Where and when did you speak your Native language?”; and “Sharing memories of boarding schools,” where Native people were punished for speaking their languages. The event will include breakout sessions. The summit will also be a chance for fluent speakers to talk to each other in their Native tongue, Worl said. “We keep hearing that our fluent speakers have no one to converse with in their communities, and they are calling people just to talk in their Native language. We want to provide a habitat for our people to speak Lingít, Xaad Kíl and Sm’algyax and for students to hear them interacting through the languages,” Worl said. The Voices of Our Ancestors Language Summit was made possible through the following major sponsors: Sealaska, SEARHC, Goldbelt Heritage Foundation, University of Alaska Southeast, Haida Heritage Foundation and individual donors and through the Pick.Click.Give. program. The summit is open to the general public, but SHI expects the public’s role to be that of observers and not participants. The news media is encouraged to cover the event.